four book challenge: onward by howard schultz. lessons behind the global coffee company’s comeback. In 2008, Howard Schultz decided to return as the CEO of Starbucks to help restore its financial health and bring the company back to its core values. 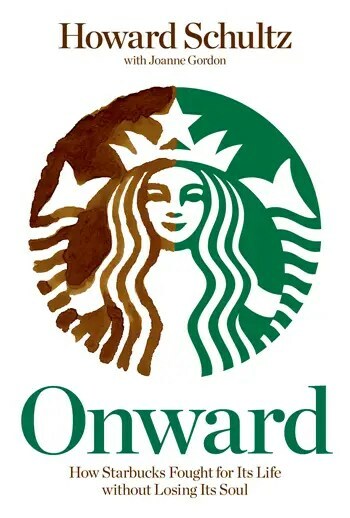 In Onward, he shares this remarkable story, revealing how, during one of the most tumultuous economic periods in American history, Starbucks again achieved profitability and sustainability without sacrificing humanity. I don’t usually read business books, but this one piqued my interest when it was released. I like Starbucks, why not read a book about it, right? I got it last year on clearance and a book like this generally stays on my shelf for a minimum of a year before I make my way to it. But I plucked this one out early. For those who may be curious, the book doesn’t focus too much on the early history of Starbucks. Instead, the focus of Onward is during the time when the company wasn’t doing so well, when they were hitting lows in their stock prices. Specifically, the ceo (they don’t capitalize titles at Starbucks…) writes about ho they got there and how they got out of their troubles to become the Starbucks we know and love again. Honestly, this book got to be a bit much at times. I don’t genuinely believe all the things Schultz shares about the employees and how much they truly mean to the top brass at the company. This could be due to my slightly cynical nature. If you’ve worked at Starbucks and tell me this is true, then so be it. I mostly thought he was talking the good talk and, if nothing else, the book was a nice PR move. It almost made me want to work there… until I remembered that food/beverage service isn’t my thing. Some sections took me some time to get through, others had my eyes crossing, and the name dropping was unnecessary. But there were good parts. I was truly interested in what they did to turn things around, because I remember when they were closing a bunch of stores (including the one closest to me). Am I mad about the time I spent reading it? No. If I could go back in time, knowing what I know about it, would I tell Past Cee to read it anyway? Ehhhh, probably not. I’d probably tell her to reach for something more fun. Like the Heroes of Olympus book I’ve had sitting on the shelf since Christmas. Read if you like: Business, corporate culture, name dropping, coffee beans. The Circle Maker was last year’s non-fiction pick. shonda <3s the west wing, too! Note: I originally wrote this post before I finished the series, but since then I have completed my journey through the West Wing. As such, I added an additional actor to this and decided not to edit the intro. Mostly because I don’t want to. I was going to wait until I finished watching the complete series, but I have to mention this now before I forget it. You know how me and Sir Netflix have been watching The West Wing? Well, I’ve come across three actors from Shondaland shows and I refuse to believe that’s a coincidence. Joshua Malina: Regular cast member, seasons 4-7. Now he stars as former US Attorney David Rosen, Scandal. Kate Burton: Guest starred in Season 5, episode 12. She later went on to play Dr. Ellis Grey, Grey’s Anatomy and Vice President Sally Langston, Scandal. Jeff Perry: Guest starred in S4, episode 18. If Mr. Perry looks familiar, it’s because he’s Thatcher Grey, Grey’s Anatomy and more recently, became fantastically evil on Scandal as Cyrus Beene. Bellamy Young: Guest starred in S5, episode 10. We know her in Shondaland as First Lady Mellie Grant, Scandal. James Pickens, Jr.: Guest starred as the Mayor of DC in S5, episode 15. He’s more well known to you as Dr. Richard Webber on Grey’s Anatomy. Matt Letscher: Guest starred as a federal prosecutor in S7, Episode 15. On Scandal, he’s the one and only, the devious nutso himself Billy Chambers. Listen. If it was just one person, maybe I could’ve believed it was a coincidence. One of those “oh, hey, look! Dr. Webber was on West Wing!” But six? SIX? It should be noted that when I was searching for Mellie’s real name, her Wiki page also notes a guest starring role on Grey’s Anatomy. I think you’re all smart enough to see the pattern for yourselves here. After writing this, I googled “west wing shonda” out of curiosity. You know what came up? Quotes from Ms. Rhimes herself stating that she’s seen every episode of the Aaron Sorkin show at least five times. conversations with: an older cousin. My cousin was in from out of town one weekend and because she liked our Instagram pictures from rock climbing, she wanted to go with us. It was up to my sister to inform her of the proper rock climbing attire – she did not do so. When my cousin and my sister arrived at my house, I hadn’t finished getting dressed yet. I was, at that point, in a sports bra and yoga pants. Me: [Seeing her colored denim and Gucci loafers] What are you wearing?? We’re going rock climbing. Cousin: Nobody told me what to wear. I didn’t know. Me: My sister was supposed to tell you so you didn’t come out all super cute and stuff. Cousin: Well, I didn’t know we were going to be showing off six-packs. Me: [Looking down at my stomach] Girl. That is not a six-pack, it’s a deep breath.